When I first started fishing in Florida in the mid-1990s, I’ll confess that I kept score: if I was trying to land a monster tarpon in Boca Grande Pass or hit a school of snook in the mangrove fringe in Charlotte Harbor and I didn’t succeed I was disappointed. Yes, I knew it was “fishing” and not “catching,” but I approached it more as a competitive sport than as a relaxing pastime. I had a chance to practice this mellower approach last week, when I went flats fishing in the shallow waters on the Gulf of Mexico side of Key West last week with my oldest son. 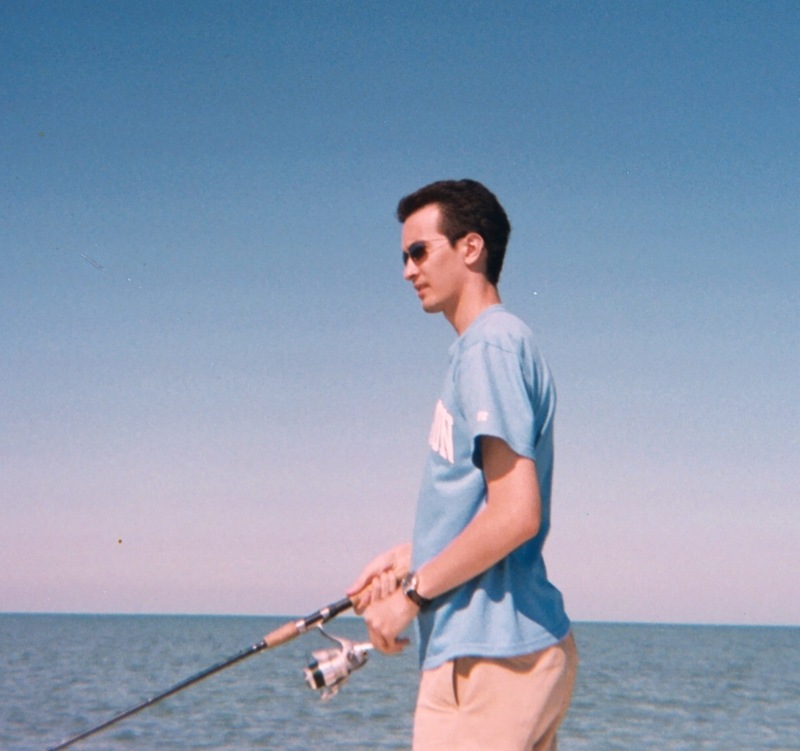 I hoped to catch some bonefish (a species I hadn’t encountered before) or tarpon. Our good-natured fishing guide, the cigar-smoking Captain Lenny Leonard, took us to a series of shallow-water spots near the Mud Keys and Snipe Key, where we fished from his flats boat with spin rods. We found clear blue skies and the unrelenting southern Florida sun awaiting us as Leonard let his boat drift over the flats, where the water stands only two or three feet deep. For the first several hours we were alone—no sign of other boats or people in our line of sight, the landscape looking much as it must have when only the Calusa inhabited the Keys. We cast jigs and plugs, hooking (and releasing) a number of jack crevalle. The lingering shoulder bursitis that’s robbed my tennis serve of whatever power it once had has also forced me into casting side-arm instead of overhand—leaving my casts well short of my son’s (to his amusement). There was much to contemplate. Around and above us, the birds: a bald eagle sitting proudly in a nest on a mangrove islet, the pelicans, herons, terns and gulls soaring and diving; in the water, an occasional jellyfish or small shark floating over the turtle grass bottom, and on the floor, loggerhead sponges. We had no luck with the bonefish—their typical haunts along the mangrove fringes were barren of the Gray Ghost, perhaps because of the slightly cooler water temperature—but we finished with a flourish–my son caught a barracuda with light tackle, bringing the fish to the boat for a quick picture before releasing it. Then, back to Key West Bight, with a resolution to return to the flats (sooner rather than later), and the hope that the Babylonian proverb is true that the gods do not deduct from man’s allotted span the hours spent in fishing. THE WHITE HOUSE ANNOUNCED THAT FEDERAL STIMULUS SPENDING HAS “SAVED OR CREATED” 640,329 JOBS SO FAR. Not 640,328 or 640,330, but 640,329. Of course this is nonsense—there’s no precise way to accurately calculate any job creation or job savings impact and the Obama Administration opens itself up to mockery for its fuzzy math. The problem for President Obama is managing perceptions: after passage of a $787 billion spending bill the Administration claimed would keep national unemployment at 8 percent, the reality has been jobless figures in the 10 percent range and fears of a jobless recovery or a “W” shaped recession, despite GDP growth of 3.5 percent in the third quarter of 2009. Has economic stimulus spending worked? The impact of cash-for-clunkers, first-time home buyer tax credits, and other cash injections into the economy clearly impacted the third quarter growth numbers. As to the other stimulus spending: a focus on propping up education and public sector employment, rather than heavy investments in infrastructure projects, may prove misguided in the long-term. If unemployment remains in the 10 percent range, voters will punish Congressional Democrats in the 2010 elections. Hannity’s double standard is troubling: he challenges those on the left who voice 9/11 conspiracy theories (Sean Penn, Rosie O’Donnell, Mark Cuban) but remains silent when right-wingers like Corsi express similarly noxious views. IS RUSSIAN PRESIDENT DMITRY MEDVEDEV’S REJECTION OF THE CULT OF STALIN A SINCERE DISTANCING FROM “PUTINISM”? On October 30, the day of remembrance of victims of political repression in Russia, Medvedev “called on Russians to remember the political terror under Soviet leader Josef Stalin, distancing himself from the historical ambivalence of his mentor, Prime Minister Vladimir Putin,” according to Lucian Kim of Bloomberg News. Will Medvedev’s comments make a difference? The recent arrest of Mikhail Suprun, a Russian historian researching the fate of Germans sent into Stalin’s Gulag during World War II, and the seizure of his personal archives, raises questions about the openness of Russian authorities to confronting the past.